From Tuesday 9 April 2019 until Friday 31 May 2019: Enjoy 50 % off! From Tuesday 9 April 2019 until Tuesday 30 April 2019: Enjoy 25 % off! 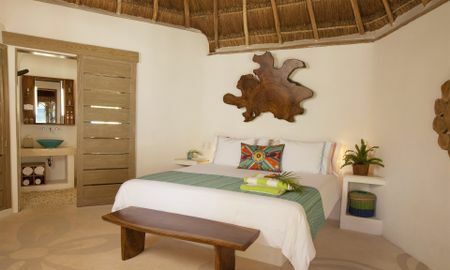 Location: Mahekal Beach Resort is located on the beach in central Playa del Carmen, close to Pier Navega. Another point of interest is Xcaret Eco Theme Park. 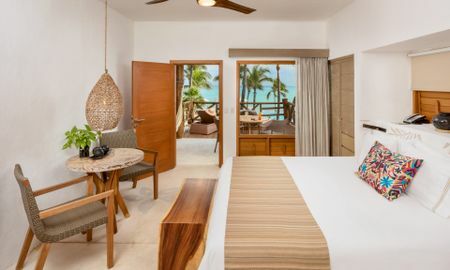 Hotel Features:Mahekal Beach Resort features a restaurant and a bar/lounge. The hotel serves a complimentary cooked-to-order breakfast. Recreational amenities include 2 outdoor swimming pools. Spa amenities include spa services and massage/treatment rooms. Complimentary wireless Internet access is available in public areas. Wedding services and tour/ticket assistance are available. Guest parking is complimentary. Additional property amenities include a concierge desk, multilingual staff, and gift shops/newsstands. This is a smoke-free property. 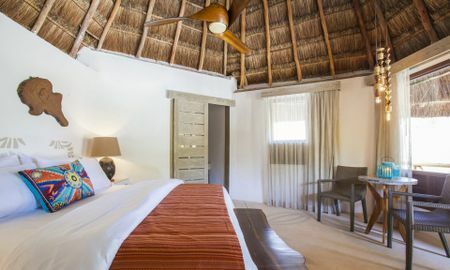 Guestrooms: There are 121 guestrooms at Mahekal Beach Resort. Guestrooms are all accessible via exterior corridors. Balconies offer ocean, pool, or garden views. Bathrooms feature showers and complimentary toiletries. Guestrooms offer desks and in-room safes. Air-conditioned rooms also include ceiling fans. Guests may request a turndown service, irons/ironing boards, and hair dryers. Housekeeping is available daily. Guestrooms are all non-smoking. 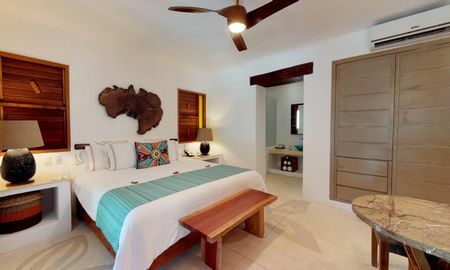 The resort is located on the Caribbean Sea with gorgeous beaches in Playa del Carmen along the Riviera Maya. Convenient to the shops and restaurants of 5th Avenue - or "La Quinta" as it is known locally- there is never a shortage of fun - sun and pampering while staying in our Mexican Beach Resort. The property is located near several bars and nightclubs, which may be disturbing to the peace and quiet of the resort. For more details, please contact the property using the information on the reservation confirmation received after booking. Please note that some events are held on Mamitas Beach Club, Martina and Canibal Royal throught the year, which may cause guests to hear loud music all around the property and Playa del Carmen. . Please note that this property has a hurricane policy. The property will contact you to provide the full information. Please note that the price for half-board does not include drinks. Any child from 5 years old to 12 years old stays for 80 USD per person per night when using an existing bed.